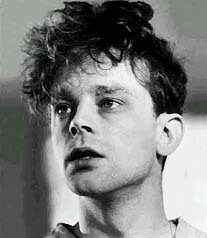 Brad Dourif is a slightly-built wild-eyed character actor, a natural for high-strung, deeply secretive, demented, deranged, disturbed, or otherwise eccentric roles. He is best known as the voice of the murderous Chucky doll in five Child's Play movies, and as Grima Wormtongue in two of the three Lord of the Rings films. Dourif always wanted to be an actor, and a small inheritance from his grandfather made it possible to pursue a career in theater. After several years building sets and performing bit parts, Dourif landed the lead in a Circle Rep production of When You Comin' Back, Red Ryder? When Milos Forman saw a performance, he offered Dourif a role as a the stuttering mental case in One Flew Over the Cuckoo's Nest. He had memorable roles in Ragtime, Dune, Blue Velvet, and Alien Resurrection, but most of his career has been spent playing creepy characters in low-budget films -- Impure Thoughts, Fatal Beauty, Terror on Highway 91, Grim Prairie Tales, The Devil's Due at Midnight, etc.